‘Lone wolf’ attacks have been carried out on Australian soil. 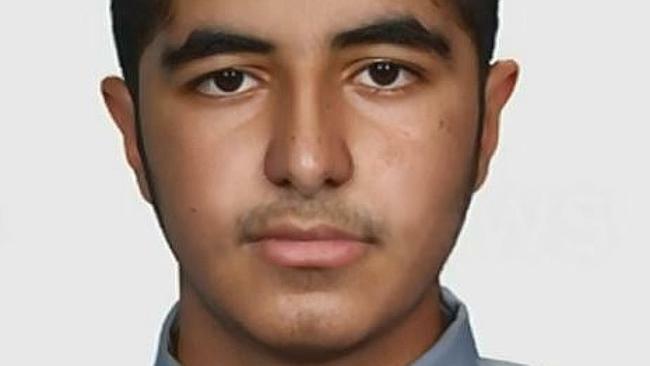 Teenager Farhad Jabar murdered NSW police accountant Curtis Cheng. Australia’s lead spy agency the Australian Security Intelligence Organisation (ASIO) identified almost 100 passports of national security concern during the last financial year as well as an escalating security threat to the nation, according to a report tabled in Parliament this week. The report from ASIO showed the increased terror threat globally has been mirrored in Australia. ASIO is the only spy agency required by law to present an Annual Report to Parliament besides the oversight agency the Inspector-General of Intelligence and Security. As such, the report provides a rare insight into the operations and thinking of one of Australia’s most secretive and – for some – most feared agencies. 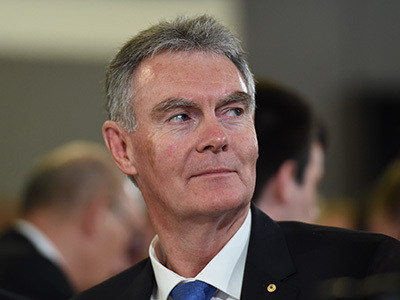 ASIO head Duncan Lewis repeatedly emphasised that terrorism from Islamic extremists was now the number one security threat facing Australia. He claimed six terrorist plots were disrupted and two terrorist attacks, the Martin Place and Endeavour Hills attacks in Sydney and Melbourne respectively, occurred during the period covered by the report. However the “crude lone-actor attacks”, so-called “lone wolf” attacks which had so far characterised terror incidents in Australia and attracted so much media attention, were far from the only threat, he said. “We must not leap to the conclusion that this mode of terrorism has replaced the threat of larger scale and more organised attacks,” Mr Lewis said. In 2014 there were 13,000 terrorist attacks globally, resulting in 32,727 fatalities, the highest rate on record. “Locally we have seen actual and planned attacks, ongoing growth in the numbers attracted to the violent extremist cause, and active encouragement from overseas for attacks to be conducted in Australia,” Mr Lewis said. “More than ever, violent extremist groups and individuals see Australia as a legitimate target for a terrorist attack. “The principal terrorist threat to Australia, Australians and Australian interests continues to come from those who adhere to a violent extremist ideology. “This ideology is associated with a range of groups that share the single ultimate objective of driving ‘apostates’ and non-Muslims from Muslim lands and establishing an Islamic state ruled in accordance with their deviant interpretation of Islam. 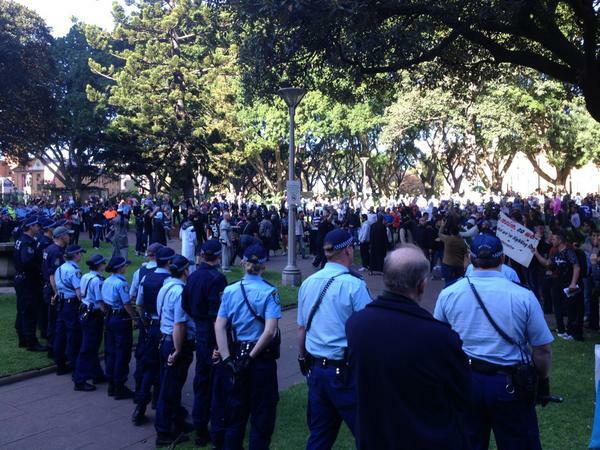 “All share the view that Western countries, including Australia, are enemies of Islam and that terrorist attacks against the citizens and interests of those countries are not only legitimate but also obligatory.”ASIO confirmed that there was likely to be increased communal confrontation following the Reclaim Australia rallies during the previous year. The increased participation and activities of Australian-based anti-Islam groups, fuelled by a steady stream of violent jihad videos, was being used as evidence that Islam was not compatible with Australian values or the Australian way of life. “Reclaim Australia rallies will continue to be held throughout the next financial year and, due to their potential for violence, will remain of concern,” the report said. Ninety-three passports were subject to adverse security assessments or suspension in the 2015 financial year, up from only 45 the previous year. John Stapleton has worked as a journalist at The Sydney Morning Herald and The Australian. His most recent book, Terror in Australia: Workers’ Paradise Lost is available on Amazon Kindle and will be available in paperback later in the year. There was no anti racism campaign or any opposition from ordinary residents of Sydney, they had to rely on the hapless police to quickly form lines of containment. Muslim men in their hundreds continually attacked the police lines with everything from wooden planks, iron rods or anything they could break off and wield. 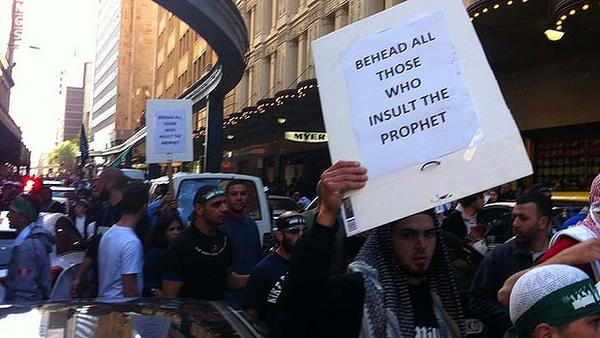 The cause of this violent and threatening expression of Muslim anger was nothing to do with any thing local Australians had done or had any control over, it had everything to do with some obscure movie that had been released somewhere in the USA which apparently they felt included an insult to the Prophet Mohammad. So to those in politics including the current Prime Minister of Australia, Malcolm Turnbull and all those in the progressive media and their lefty supporters who are so willing to blame what they describe as “redneck racist Australians” for causing Muslim angst and hatred, how do you explain this explosion of hatred on our streets in the middle of our biggest city, when none of us had anything to do with it. Australia at that time had a Labor government headed by Prime Minister Julia Gillard, supported by the extreme left Looney left progressive Greens, the very people who now insinuate that some how Tony Abbott had something to do with a worsening Islamic Terrorist threat. 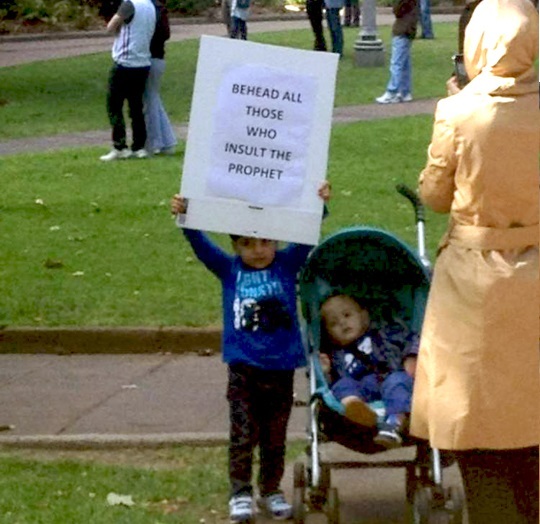 As long as the Australian media and politicians play along with this game of protecting and indulging the sensitivities of Islamic extremists, while laying blame on ordinary Australian mums and dads who are only becoming worried and politically active because they perceive a real and imminent danger, a growing threat to Australian culture and their children’s future, that is continually being played down by our elected politicians and media, the threat of violence on our streets will continue to grow. Australia’s progressive media and political class stand accused of covering up the truth, of not telling the full story as it is, and in Australia where we have always considered it important to be straight with one another, this unwillingness to trust the majority with the truth is breading a growing discontent. Ordinary Australians feel their future, their culture and that of their children and grandchildren is being put at a real risk by the promoters and those with a vested interest in the politically correct multicultural experiment that is negatively impacting their lives, and they feel our media and politics and bureaucracy are being compromised by an elite who aspire to dispense with our culture and democracy in search of recognition on a UN controlled world stage, without allowing a full discussion or informed debate and a democratic vote on the issue. 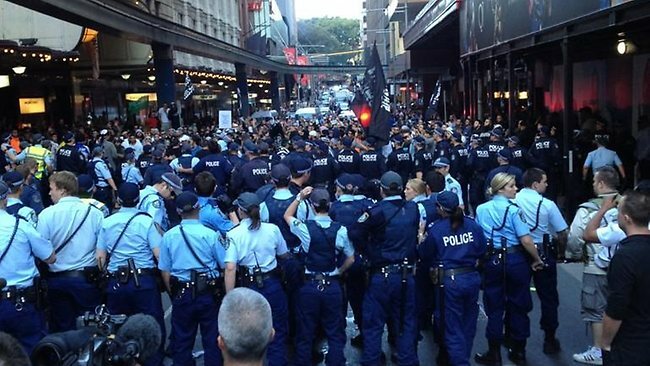 Just take a look at these few photos from the outrage in the middle of Sydney back in 2012, it was passed over in the media as a crowd of a few hundred where a small number of over exuberant young males got into a bit of a scuffle with police. Take a look some of these photos were taken almost a mile apart, only 400 people? If we can have a Channel 7 special on television which purports to be an investigation and expose into a new and dangerous right wing movement “Reclaim Australia”, then perhaps we could also look into the cause of the violence at those rallies, as there would have been no violence at all, if not for the presence of the Socialist Alliance and GETUP incited and organised thugs who turned up determined to wreck the peaceful rally. Labor and the left have been demonstrating on our streets for years without any interruption from any opposing groups on the day, yet as soon as someone wants to demonstrate in support of some political point of view the left does not agree with , it is the progressive left who instigate extremism and perpetrate violence on our streets. Australians deserve better form our politicians and our media, if there is to be the so called Mutual Trust and Mutual Respect that Prime Minister Malcolm Turnbull called for then it need to start with the politicians and the media, they need to show enough trust and respect for the Australian people to give us the whole story, stop covering up facts because of some multicultural sensitivities, because that only goes to show a complete lack of respect for the Australian people. Malcolm Turnbull is probably the last person to make any pitch for respect or trust, after showing he is incapable of either in the way he sat in the parliament, took an oath of loyalty to serve in the Abbott Government only to spend the whole time undermining the only politician to attract a majority democratic vote from the Australian people in two elections over the past 8 years. 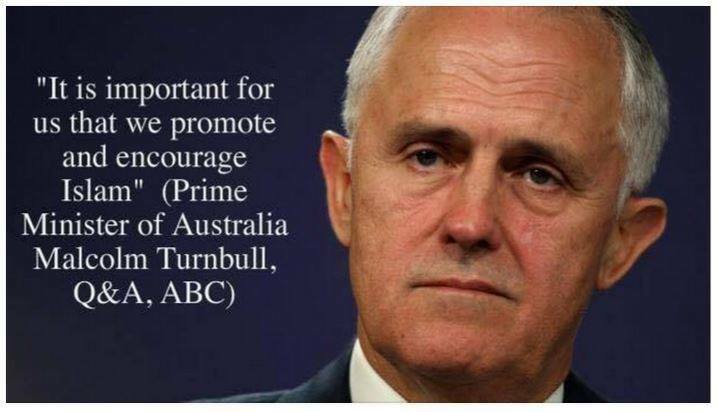 So mister Turnbull the ball is in your court, your first reaction to another innocent Australian being murdered in cold blood by a Muslim incited to kill us by people from Parramatta State School and the Parramatta mosque, is to tell Australians that to stop the spread of Islamic extremism and domestic terrorism it is down to us, we have to stop spreading hatred of Muslims. Do you have any idea what you have implied, you have effectively ignored the facts of the matter, that this sort of thing is happening all over the world wherever Muslims have been welcomed and given asylum to live in the west in big numbers, it has nothing to do with us the Australian people, what do you want us to do, are you really demanding that we must change our life style to accommodate this vicious medieval deathcult? When you talk of our proud history of multiculturalism, of welcoming and integrating so many different cultures peacefully into our community, just be aware of reality, most of the cultures you mention as examples were here prior to the invention of the term Multiculturalism, we had a very successful assimilation policy up until the mid to late 70s. The problems we are experiencing today began with the advent of multiculturalism in the 80s, again something the Australian people were never consulted on, were never fully informed about and never got a chance to vote on, as the political class set about building an alternative constituency based on an implicit deal with these new communities, that you vote for the government who let you and your family into the country.